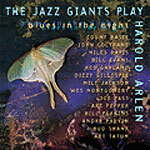 CD reviews: "Blues in the Night: The Jazz Giants Play Harold Arlen," "Yesterdays: The Jazz Giants Play Jerome Kern," "Night and Day: The Jazz Giants Play Cole Porter," "Lullaby of Broadway: The Jazz Giants Play Harry Warren" and "Blue Moon: The Jazz Giants Play Rodgers & Hart"
These reviews first appeared in the August 8, 1998 edition of the American Reporter. Not since Ella Fitzgerald's "Songbooks" series for Norman Granz has there been as complete a collection devoted to America's incomparable composers of popular song. While obviously not superior to the Ella sets, this The Jazz Giants Play series is certainly complementary to it. The obvious strength here is that the songs are performed by a wide variety of artists, bringing different sensibilities and perspectives to the music, giving a fuller reading to a composer's body of work than any single artist can provide. Too, these collections are taken exclusively from existing recordings  the wondrously rich vaults of Fantasy and its jazz subsidiaries of Prestige, Pablo, Contemporary and Riverside. So if less ambitious than the Ella set, this collection is also far less self-aware -- the artists involved recorded these songs as a normal, organic part of their careers not ever knowing they'd be part of some larger collection 10, 20, 30 or even 40 and more years later. The Songbooks were a conscious effort to create a new standard. For better or worse, that realization had to have affected Ella's work during the recordings. Of course, the weakness of this collection is that producer Eric Miller (not coincidentally a protégé of Granz, and now his successor at Pablo) is limited to those songs available to him. But the fact that each disc comes in at well over an hour, and that the fewest number of songs per disc is 13, Miller wasn't exactly shortchanged. The only other complaint against The Jazz Giants Play collection is the absence of discs dedicated to the Gershwins or Irving Berlin. But we can hold out hope that those will be added later. Enough of comparisons and complaints. How about the music? Only the greatest names in jazz history are here. Count Basie. Miles Davis. John Coltrane. Thelonius Monk. Sonny Rollins. Zoot Sims. Barney Kessell. Chet Baker. Stan Getz. Not all are on every disc, of course  depends on what and whom they recorded while with the above labels. Take the Harry Warren collection, though. There we get Lester Young doing "Jeepers Creepers," Johnny Hodges on "Rose of the Rio Grande" and Lockjaw Davis on "I Only Have Eyes for You." The Cole Porter disc features, among others, Joe Henderson playing "I've Only Got Eyes for You," Art Tatum with "Begin the Beguine" and Art Pepper handling "You'd Be So Nice to Come Home To." By now, even if you've not heard of these songwriters before, you've figured out that you surely know their songs. The Jerome Kern CD, for instance, has all these chestnuts: "All the Things You Are," "Smoke Gets in Your Eyes," "Ol' Man River," "The Song Is You" and "The Way You Look Tonight." Harold Arlen: "Over the Rainbow," "That Old Black Magic" and "It's Only a Paper Moon." Rodgers & Hart: "The Lady is a Tramp," "With a Song in My Heart" and "My Funny Valentine." Let's face it, the songs on these five discs are among the best written this century. They are the songs that have populated our films, filled the airwaves and served as the background for a heck of a lot of conceptions.